"A...blend of nutrients and vitamins with an extra boost for oral health." "A good all-around choice to promote better nutrition throughout the day." "Comes with four different packs made up of chicken and other meats." "Helps to break up existing hairballs so your cat does not suffer." "The perfect choice for a snack that is on par with most real meals." "A healthy, long-lasting treat with some different flavor options." "One of the best options that is grain-free and still tasty at the same time." The best healthy cat treat depends on the particular cat. All cats have different digestive and nutritional requirements, meaning some treats with certain ingredients will have different results for different felines. One thing that all cats need, however, is a healthy set of teeth to eat in the first place. The top spot for this list goes to treats that tackle good cat oral and general health at the same time. 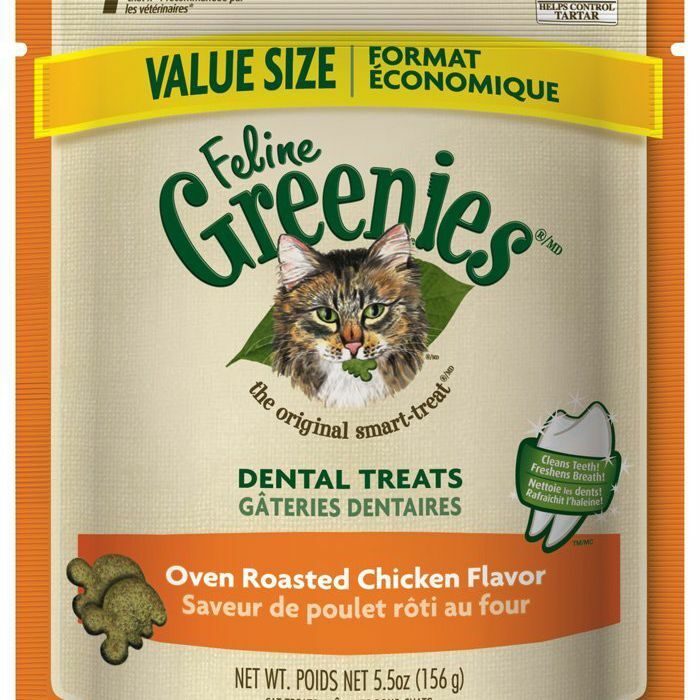 Greenies’s Feline Dental Cat Treats offer a balanced blend of nutrients and vitamins with an extra boost for oral health. Coming in many different flavors, the treats help keep cat teeth clean, which helps in other health-related areas as well. For example, healthy teeth can keep risks of heart disease down, making this treat a great way to keep your cat in great shape. One issue that many people have with cat treats is the cost. Individually, treats are quite affordable. Unfortunately, if you want to have a steady supply of treats for your cat each day, costs can add up. That is where the advantage of budget or value cat treats come in handy. Extend your money without sacrificing the quality and quantity of your cat treats. For a treat that will not hurt the wallet each time you visit the store, the Temptations Classic Tasty Chicken treats are a great choice to consider. Coming in a healthy recipe with flavor chicken, these treats are a good all-around choice to promote better nutrition throughout the day. Best of all, no artificial flavors are used so the cat will enjoy the real thing without the price of actual meat. Cats are just like humans in that they appreciate some good variety every now and then. Cat treats tend to come in many different flavors. Mixing these flavors up is a great way to keep your cat happy and healthy at the same time. The best way to add this variety is with a good assortment pack. As a great, economical cat snack choice, the Blue Buffalo Wilderness Treats are the best value for the money. The entire set comes with four different packs made up of chicken and other meats. Chicken and duck, chicken and turkey, chicken and trout, and chicken and salmon are the four primary flavors you can choose to vary the flavors each day or at any other time. Beyond general health, one of the most difficult issues to address is digestive health. Your cat’s digestive system is crucial for providing the energy it needs to live happy and healthy. Hairballs are a common digestive issue that can be harmless or a major issue depending on their severity. To control and prevent hairballs from forming, the right diet is required to keep the digestive system working properly. Iams’s Proactive Hairball Care Treat helps to break up existing hairballs so your cat does not suffer digestive and airway problems. Using a subtle chicken flavor, the treats are something most cats will enjoy. 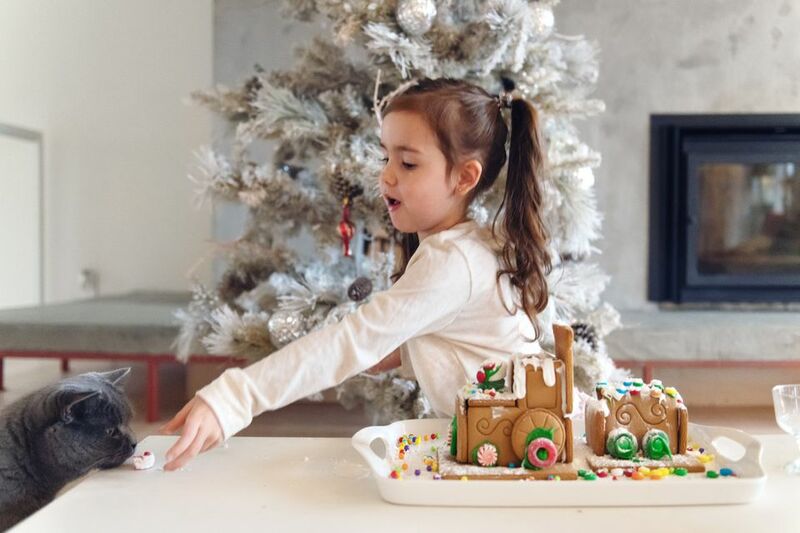 Beyond hairballs, the treats also help to clear the cat’s digestive tract, promoting healthy eating and reducing general health issues at the same time. Wet cat food is often the freshest, most natural food you can choose for your pet. It also tends to be the most expensive when looking at healthy options for a proper meal. Wet cat snacks are a great alternative that deliver the same great, fresh taste at a much lower cost. Best of all, wet treats are also free of most chemicals and artificial additions. Sometimes, your cat needs the real deal to feel healthy and comfortable. Purina’s Purely Fancy Feast is the perfect choice for a snack that is on par with most real meals. A blend of white chicken meat and tuna broth skips the common artificial preservatives and flavors found in less healthy alternatives. Instead, your cat will enjoy the true taste of meat within an all-natural recipe. Sometimes, it is nice to keep cat treats around for a long time if your pet does not devour them all in one sitting. Long-lasting cat treats save money, but you have to be careful with how the food is preserved for long periods of time. Artificial additives and preservatives are widely common but can be harmful to your cat’s overall health. When you want a healthy long lasting treat with some different flavor options, the Vital Essentials Freeze-Dried Cat Treats are hard to beat. Freeze-dried to avoid the use of artificial preservatives while extending the life of the food, these snacks come in several flavors like minnows, chicken giblets, and ahi tuna. The recipe is also grain- and gluten-free for cats with more sensitive digestive systems. Much like humans, cats can have different types of food allergies that can be harmful to their digestive system if consumed. Grain allergies are some of the most common and easy to address when you look for grain-free foods to feed your cat. Wellness’s Kittles Crunchy Natural Treats is one of the best options that is grain-free and still tasty at the same time. This option is also one of the only cat treats that includes real fruit flavors into the mix. Using a meat and cranberry blend, these treats will offer your cat something different to enjoy while getting a more balanced, nutritional diet without the carbs of grain. Different meat choices include duck, chicken, tuna, salmon, turkey, whitefish, or a variety pack.